The trends of global economic growth reflect two contracting stories. If many of the African and some of the Asian economies failed in pulling off the much-desired growth, rise of countries like Japan, Singapore, South Korea, China etc surprised the world. India stays somewhere in between these two extremes. Development is neither universal nor uniform. In the market driven economy, the fruits of development are not distributed evenly leading to imbalanced society. The persistent economic crisis in different parts of the world has made economists to wonder whether the practicing economic growth models are potential enough to generate sustainability in growth. Economists and policy makers also ponder the question of how large is the size of trade-off between economic growth and sustainable development. Thus, the major and immediate challenge of the current century is to generate growth which is inclusive and sustainable. In order to create a better and sustainable future, Governments, Corporates and NGOs need to work collectively and playing their respective roles most effectively. 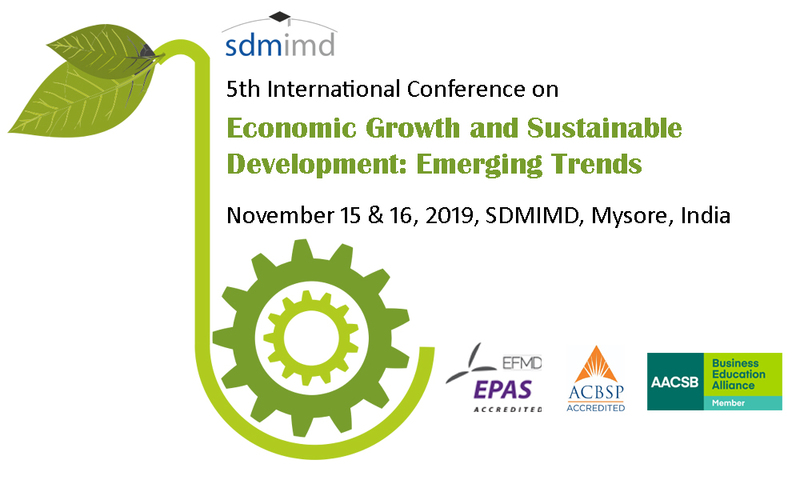 In this backdrop, to provide a stimulating platform for academicians and practitioners to reflect, deliberate, and suggest measures that are needed both at macro and the micro levels to elevate India and other backward economies to higher and sustained growth trajectory, Shri Dharmasthala Manjunatheshwara Institute for Management Development (SDMIMD) is organizing the international conference on “Economic Growth and Sustainable Development- Emerging Trends” on November 15-16, 2019. The conference offers two publication opportunities. All the papers that are accepted for conference presentation having duly completed the registration process will be published in electronic medium (CD) in the form of ‘Compendium of Papers’ bearing an ISBN. Select papers emerging out of double-blind review process will be published in the EBSCO indexed refereed journal – SDMIMD Journal of Management bearing an ISSN. SDMIMD is organizing international economics conference since 2015. The past four editions had overwhelming response & participation from across the world. Copyright © 2019 Economics Conference 2019. Powered by WordPress. Theme: Spacious by ThemeGrill.